If you’re feeling discouraged with your progress in English and need a dose of motivation to get back on track, this episode is for you. We look at one the top keys to success — not just for learning English, but for ANYTHING you aspire to do. Hi, and thanks for stopping by. There’s no conversation today; instead I’m trying something new — an audio version of an article on my website, just to shake things up and experiment with something different. You’re going to hear me sharing some thoughts with you that I hope will help motivate you to keep going if you’re struggling with your English right now and feeling like giving up. When you’re learning a new language, it’s pretty common to feel discouraged sometimes, especially if you’re more or less at the intermediate level and have run into the dreaded “intermediate plateau.” If that’s where you are right now, you have my sympathies. But there’s nothing wrong with you; it’s okay and you’re totally normal. 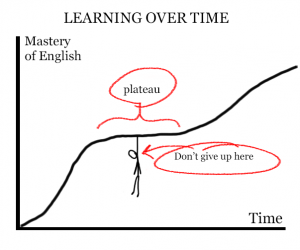 Progress in language learning isn’t linear, and all learners find themselves stuck on a plateau from time to time. But even if plateaus are normal, it doesn’t mean that you have to stay there. There is one huge factor that influences whether you will push through a plateau and continue to progress, or throw up your hands in despair and give up. And that’s developing routines and behaviors that make success more likely to occur. But if you’re stuck in a rut with your learning, it’s sometimes hard to know where to start or what to change. One useful thing you can do is look at successful people you admire and try to figure out what you can learn from them. If you are stuck on the intermediate plateau, don’t give up! Now, I’ve got a confession to make: as a recovering procrastinator, I struggle every day with my own plateaus, insecurities and mental blocks that keep me from being as successful and productive as I wish I could be. I feel more comfortable holding myself up to you as a cautionary warning than a motivational example! But as I work to improve, I’m happy to pass along the things I learn about from other successful people. We can examine their thoughts, actions, and habits and look for useful ideas to try out ourselves. And while we do that, we can also take small detours into interesting vocabulary or other language points that come up along the way. Today we’re going look at an often repeated quote about success — it’s one of my favorites. You’ll find out who said it, what it means, and what we can learn from it. 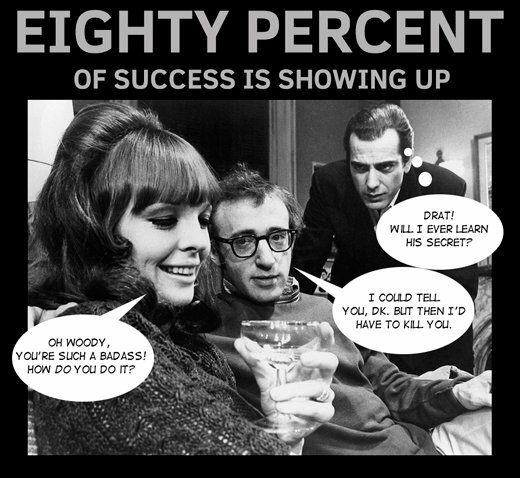 Woody Allen knows that 80% of success is showing up. Have you heard it before? It’s usually attributed to Woody Allen. If you don’t know Woody Allen, well, let me just say that between his writing, acting, and film making, the dude is a badass ninja of creative productivity. Pretty much everything the guy does ends up getting nominated for some prestigious award or another. His first big award was in 1977, when his film Annie Hall won the Academy Award for Best Picture. Have a look at his awards page on Wikipedia if you need convincing. In a nutshell, Woody Allen is someone I feel totally comfortable taking advice from. 80 % of success is showing up. First off, there’s an opportunity for some quick’n’dirty language analysis. This quote contains the phrasal verb: to show up. I know you love phrasal verbs, so let’s take a moment to explore this one before we go on. Julie said she’d meet me at the party, but she didn’t show up. It really disrupts a class when students show up late. But you can also extend the meaning of to show up into something more like “taking action in general.” Do you think that’s what Woody Allen meant? Fortunately, we don’t have to guess. I found a great interview where he talks about the background to his famous 80% quote. I’m going to read some of the best outtakes from the interview for you. Let me just remind you that this is a massively successful guy telling us about his biggest life lesson. I don’t know about you, but I’m paying attention! There, I just demonstrated it. Hemming and hawing is when you speak with a lot of pauses, fillers like umm, err, or well. It can also mean speaking in a roundabout way without getting to the point. Woody wasn’t talking about hemming and hawing in speech. He was using the expression to describe a kind of action — hemming and hawing by procrastinating and delaying the real work at hand. Let’s imagine, for instance, that you have to write a research paper for work or school. Instead of doing meaningful research and getting started on your draft, you find yourself spending a ton of time fiddling with your fonts, formatting and page layout in your word processor. In the back of your mind you know this isn’t what you should be doing to move forward, but you just can’t get started with the real work. This is the kind of hemming and hawing that Woody was talking about. 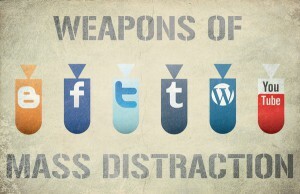 So stop playing with those paper clips! I see an opportunity for some language analysis. In the quote, did you notice how Woody shifts from using the first person I to using the second person you? That’s you in the sense of “people in general.” He says, “When I want to write, you get up in the morning…” etc. That might seem like a weird thing for a native speaker of English to do. But there’s a good reason for it. I don’t know about you, but I sure have a lot of my own examples of having the desire but not the discipline and striking out instead of succeeding. I wish I could draw, but I don’t want to spend time practicing every day. I wish I could be an amazing portrait photographer, I’m too shy to ask strangers to let me practice by taking their portraits. I wish I could teach my dog not to bark her little head off when people come to the door, but I don’t have the discipline to be 100% consistent in training her. I’m sure you’ve got your own examples. Now, it has to be said: maybe we strike out because those things aren’t really that important to us. It’s a real struggle to put time and energy into something if it’s not high on our list of priorities. There is a lot to talk about concerning motivation, but we’ll leave that for future episodes. So to sum up, to succeed at something you have to actually to do it. A lot. It may seem obvious, but I think the importance of this simple truth can’t be stressed enough. Woody Allen calls it “the biggest guiding principle of [his] life, the biggest life lesson that has worked.” He says that all other methods have failed him. So when you’re frustrated and tempted to give up, that’s where you need to buckle down, take a deep breath, and promise yourself to keep showing up. Keep doing the work. I know it’s a challenge, and in future episodes, I’m planning to give you tips, strategies and small, actions that can make it easier. But I don’t want to leave you hanging: here is something you can try today, as soon as you’re done listening. Take a moment and really ask yourself, “Have I been doing the work?” Be honest, nobody is judging you. If your answer is yes, then that’s awesome. If you’re happy with your progress, give yourself a pat on the back and rock on! But maybe your answer is no. Or maybe you answered yes. You are working hard, but still not happy with your progress. That’s OK; today is the perfect day to start turning that around. Ask yourself, “Is there one small thing I could do today, one small change I could make, that would help me get just a little bit better at English?” It really doesn’t have to be a big thing – it can be as simple as deciding to finally go dig out the dictionary you have buried in your closet so you can actually use it when you need it. You might decide to pay just a little more attention in class if you have the tendency to drift off. If you like, your simple action can be to email me and tell me about your frustrations or struggles with English — I’d love to hear from you, and I can keep you in mind when I’m making new episodes. I’d be surprised if you couldn’t think of some small change you can make. Then, once you’ve decided, I think you know what Woody Allen would tell you to do: Go do the thing! I’ll be giving you virtual cheers and high-fives from here at Better at English HQ. That’s all I’ve got for you today. If you have questions, suggestions or any other feedback, you can reach me at betteratenglish.com/contact. If you’ve made it this far, thanks for sticking around! If you’re feeling a tiny bit more positive and motivated about your English, then my work here is done for the day. Until next time, happy learning, everyone!